"murder on the orient express"
THE STORY - Having concluded a case, detective Hercule Poirot (Albert Finney) settles into what he expects will be a relaxing journey home aboard the Orient Express. But when an unpopular billionaire is murdered en route, Poirot takes up the case, and everyone on board the famous train is a suspect. Using an avalanche blocking the tracks to his advantage, Poirot gradually realizes that many of the passengers have revenge as a motive, and he begins to home in on the culprit. THE GOOD - Sidney Lumet’s stage background works harmoniously with this Agatha Christie’s story. Suspenseful. Well-shot and acted. THE BAD - Occasions of stretched pacing. ​Kenneth Branagh is making the expensive locomotive that Agatha Christie reframed into an iconic crime scene ready for boarding again, but not much rejoicing is in the air. Such a reaction doubles as evidence that the fondness for the Orient Express’ two “first stops” in popular culture - a page-turner in 1934 and then a film in 1974 - remains vivacious. How true: With sophistication in both form and function (Plus no demand for one’s reading skills) Sidney Lumet’s “Murder on the Orient Express” is still a gratifying mystery, even if revisiting it today really points out the fact that it’s a 43-year-old production. “Murder” follows the whimsical-but-sharp and world-famous Belgian detective Hercule Poirot (Albert Finney) investigating who has fatally stabbed a passenger, businessman Ratchett (Richard Widmark), 12 times. Rounding up the suspects is fairly easy since nowhere else besides the Istanbul-to-Calais train is habitable amid the wintry landscape, and still present at the crime scene are two men whose jobs are to closely assist Ratchett - jittery secretary McQueen (Anthony Perkins) and loyal manservant Beddoes (John Gielgud) - picky widow Hubbard (Lauren Bacall) who sleeps in the next bunk, condescending Princess Natalia (Wendy Hiller) and her maid Hildegarde (Rachel Roberts), evasive English teacher Mary (Vanessa Redgrave), her intense lover Col. Arbuthnott (Sean Connery), God-terrifying missionary Greta (Ingrid Bergman), Mafia-linked car salesman Foscarelli (Denis Quilley), theatrical agent Hardman (Colin Blakely), conductor Pierre Michel (Jean-Pierre Cassel) and interrogation-proof Hungarian diplomat couple - Count and Countess Andrenyi (Michael York and Jacqueline Bisset). Each one of them by all accounts is a suspect. It’s perfect to have acclaimed director Sidney Lumet helming this Christie outing; the train’s confines add up to become another stage for the director, whose oeuvre is linked to the theater, giving him the ability to flex his talents. There is beauty in Lumet’s character-focused approach wherein faces, gazes, mannerisms, accents, and inflections instill life into the space for the actors to work in. This is not to say Lumet is sidelining Geoffrey Unsworth’s photography, Richard Rodney Bennett’s score or Tony Walton’s designs - their contributions, all of which amplify the stateliness adorning the Orient Express, get to shine through the film’s brilliant periods of silence, tracking shots and tension-building - but it’s clear what he loves to capture in-camera more: The performer who is about to be interrogated by Poirot. That’s the bulk of the film, the mustachioed bloodhound versus his suspects (And potential murderer), and every second of it brims with interest thanks to top-notch acting. Not visible to the viewer is an invitation to co-solve the case with Poirot, which only serves to keep the audience thoroughly engaged throughout. As the detective, Finney’s excitingly loud and incredibly lively turn easily catapults him to being considered the best actor in “Murder On The Orient Express” aside from owning the best set of whiskers in all of cinematic history. Debate abounds when deciding who is the best actress between Bacall and Bergman. A contrast, their characters are, and yet both exude a fire designed to have us fixated on. Bacall’s Hubbard is outspoken enough that even Poirot is freaked out, which is amusing to witness. Bergman’s Greta, meanwhile, is so delicate that Poirot’s most casual of questions seem like a scalpel ripping at her skin; the actress’ five-minute one-take scene is undoubtedly one for the ages. 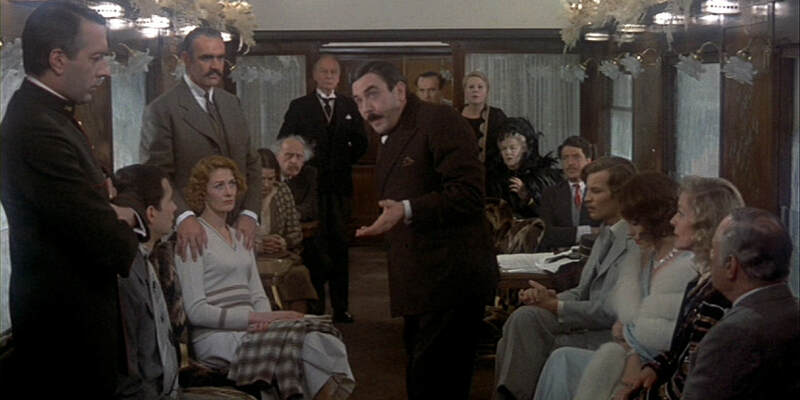 Where the 1974 production of "Murder On The Orient Express” stumbles is in its pacing, stretching out a tad too much to establish the lead (And highlight his quirks) and telegraphing where the points of escalation are during most of the interrogations. But these aren’t missteps from Lumet and company; those “flaws” are more reflective of how cinematic storytelling functioned at the time. Also, no one in 1974 could foresee the innumerable evolutions in filming techniques and regrettably, what would constitute as a “shocking” crime in today's society. Regardless of the dust that covers its brilliance, this is a mystery film absolutely worth re-jumping on board for.